I hope that by now you've read the Amazon 3 Wolf Moon shirt reviews. They've been around for a good while. But in case you haven't, you can read all about this AMAZING shirt here on Amazon . Since I first read about the 3 Wolf Moon shirt, I've had a longing. I've felt as if something was missing in my life, but I couldn't put my finger on it. Sometimes, I would just stare into space with a sense of emptiness. That is, until yesterday. When the UPS man walked up our muddy driveway (which due to melting snow is currently unpassable without four wheel drive) with a huge box I felt an eerie tingling. The box was from my high school friend, Ginger (Thanks, Ginger!!). I knew she was sending a bunch of clothes for the twins, and was excited about that. But that didn't explain my shivering. Then I opened the box. 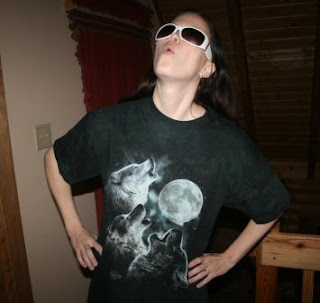 There, right on top, was the 3 Wolf Moon shirt. I paced back and forth. I knew that once I put this shirt on, my life would never be the same. It was a point of no return of sorts. There's life before the 3 Moon Shirt and then there is life after. And unless you've actually worn the 3 Moon Shirt you won't understand. Sadly. So here I am, the moment the wolves settled across my skin. The rest of the night is a blur. I ran up and down our mountain several times, racing the deer. I'm proud to report that I won those races. The deer have nothing on the 3 Wolf Moon shirt. Thanks to my heightened sense of hearing, I heard the crackling of a fire about a 100 miles away, so I ran there and helped put the fire out. I saved 4 kittens and their mother. I also shoveled the snow off our 10 acre horse pasture, because the horses were kind of low on grass. For some reason, the horses kept snorting at me in the 3 Moon Wolf shirt, but I was so busy it didn't upset me too much. I finally went to bed around 4 am, and woke up at 5 refreshed and ready to feed the twins. I'm a little hairier this morning (particularly my arms, which have become downright furry), but otherwise I feel great. Don't delay! Place your order for the 3 Wolf Moon shirt TODAY! Your life will never be the same!! Glad it's a hit. Let me know if you run into Jacob, Quil & Embry, and I'll put mine on and join you! Sounds like something out of the twilight series. Do snazzy glasses come as part of the deal? I don't know how I have survived so long without mine...gonna rush out and get me one :) Love the post!!! But not the hair--ewww--don't want that.